Wow! What a year! The Accidental Locavore has had so much fun with the Charcutepalooza challenges, not to mention what great charcuterie we’ve all been enjoying! For the “Showing Off” challenge, I did just that. My goal was to make all the things I’d thought about making over the course of the year and hadn’t done (yet). The bigger challenge was to find a venue for showing them off. You see, my husband — best taster and fiercest critic — works non-stop from the beginning of November (why he never saw the chorizo drying) through New Year’s Day, so a dinner party chez-nous wasn’t in the picture. Luckily, my friend Leslie has a “left-over” supper the Sunday after Thanksgiving where you can bring anything you’d like, so I was set! My plan was to make two different pastramis, some bacon, the chorizo (from the November challenge) and a pâté de campagne. Over the summer, we’d had wonderful local lamb pastrami and a delicious beef tri-tip pastrami, and that became my pastrami inspiration. At the time of the bacon challenge, I didn’t have a smoker, so I’ve been dying to make more bacon and smoke it this time; this would be for personal consumption (sorry Leslie). 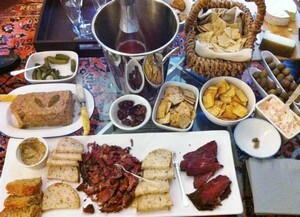 The pâté is always good for a crowd and could be back-up hors d’oeuvres if (God forbid) the pastrami and chorizo didn’t work out. Once the refrigerator was stuffed to the brim (Santa Baby, how about a large-capacity fridge?) with pork belly, lamb shoulder, tri-tip, more pork (shoulder) a couple of duck legs (more about that in a minute) and more than a few duck livers, I got to work. Curing and/or brining the meats, then schlepping them to my country house for a weekend of intensive smoking. After a great breakfast featuring the bacon and some of my friend’s eggs, back to the city to finish the pastrami and make the pâté. While most people were fussing over turkey and stuffing the Locavore was steaming, grinding, confiting and having a great time! 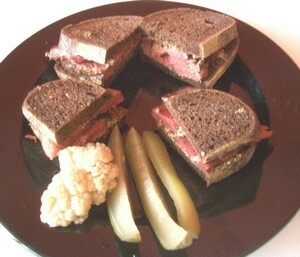 A few hours later, beautiful pastramis (begging to be put in a sandwich…I acquiesced…fantastic! 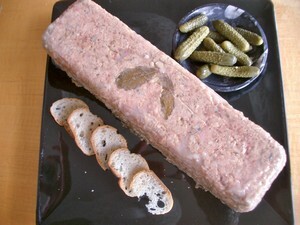 ), a big terrine of pâté, a ramekin of duck rillettes (the mixer was out and I had the duck confit…) and the chorizo, all once again, making a mockery of my refrigerator’s capacity. The verdict? OMG! It was all great! 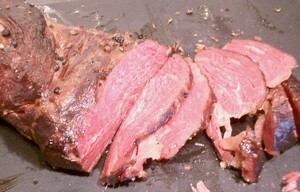 Both pastramis were really good, the Locavore preferred the lamb, but they both had great taste and texture. 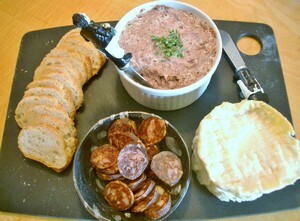 The duck rillettes we previewed before the party and they were good, but even better after a couple of days in the fridge, giving the flavors a chance to develop. There is currently a prominent Manhattan dermatologist who would not stop raving about the pastrami and will probably Botox my entire body in exchange for a slab of it. And while the challenges may be over for the time being, I’m going to go on grinding my own meat, making sausages both fresh and dried, perfecting bacon and smoking chickens (much faster butterflied and done two at a time). The duck confit (done sous-vide) will be a staple and I’ll just have to work out that much harder. Thank you to Cathy and Kim for having such an amazing idea and letting me be a part of it!